Our Cleaning & Washroom Signs are multipurpose, durable and affordable, complying with all modern legislation and industry guidelines. Clearly displaying them in bathrooms and cleaning areas helps as part of a wider health and safety policy to safeguard public safety and improve levels of hygiene on site. Information signs can prove useful in all kinds of places, from schools and offices to warehouses. Each of the signs we stock clearly advise staff and visitors of the need to maintain clean hands, washrooms and work areas at all times. This constant reinforcement helps to reduce contamination risks and ensure that hygiene standards (both personal and in the premises) are adhered to. Hygiene in the workplace is an important factor to be considered – in terms of both maintaining your employees’ health and ensuring that they are able to continue to perform their role without being exposed to risk. Our Cleaning & Washroom Signs act as polite reminders to ensure employees and visitors maintain their own levels of personal hygiene, as well as cleanliness in communal areas of your premises. This may seem like a small part of day-to-day life, but has proved to be invaluable to businesses in terms of efficiency and expenditure. Although signage alone cannot completely eliminate problems with poor staff cleanliness, it certainly acts as a good reminder. Combining Cleaning & Washroom Signs with other products can help you to ensure that facilities are clean and health and safety standards are being met consistently. By taking action to ensure you have well stocked hand soaps and paper towels throughout the day you can create an effective washroom cleaning/inspection routine. Waste Bins should also be emptied regularly and signs, such as our 'Leave this washroom as you'd wish to find it' Signs, 'Use hand sanitiser' Signs and 'Wash your hands please' Signs can all be displayed nearby to enforce clean behaviour and best practice. Sometimes enforcing cleanliness rules is even more important for general safety reasons. For example, communal areas may benefit from notices such as our 'Keep this area tidy at all times' Signs. Keeping these areas clean is important to avoid other risks, such as trips hazard or in the event of a fire. Consider affixing Fire Safety Signs in such areas. 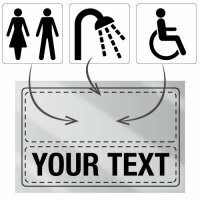 Our Cleaning & Washroom Signs are easy to apply and mount to whichever surface you see fit. Check out our range of Sign Fixings for the perfect solution for your needs, be it permanent or temporary, heat or chemical resistant or for use both indoors and out. Being able to apply our signs anywhere means that there are no excuses to be lax on cleanliness – which in turn will reduce the business’ risks of injury, illness, contamination, fire risks and outgoing cleaning costs. These areas are especially important for those who work in restaurants or in food preparation areas. Our friendly team of expert advisors can help you find or customise the perfect Cleaning & Washroom Signs for your needs. All of our signage complies with current health and safety guidelines and is highly durable yet affordable. Our wide range of signs are available in different sizes and orientations and are made of long-lasting, durable materials, making them extremely good value. Not only this, but should you not find a sign that perfectly suits your needs you can utilise our custom safety sign service to ensure you get exactly what you require.